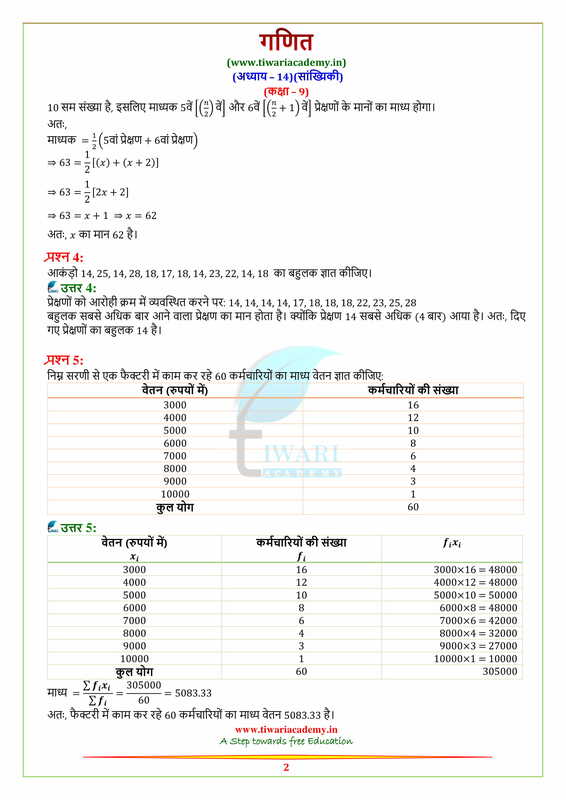 NCERT Solutions for Class 9 Maths Chapter 14 Exercise 14.4 statistics in English Medium and Hindi Medium free to use online or download. 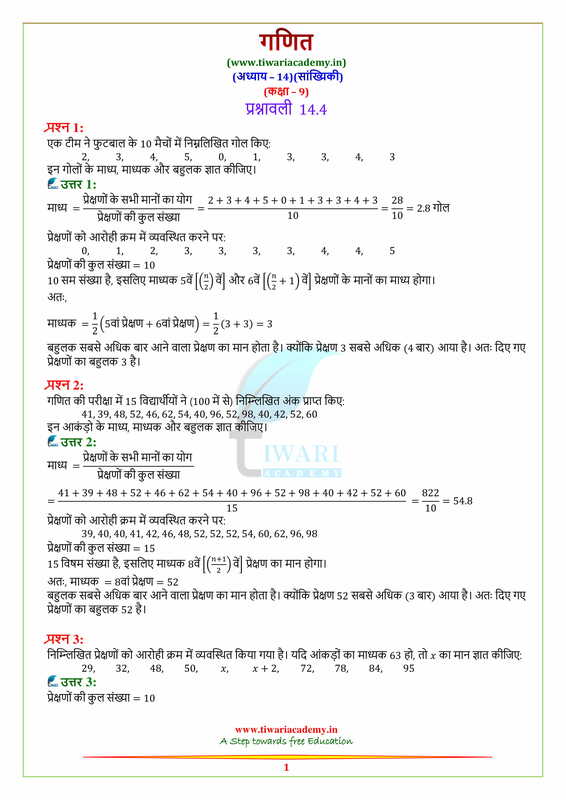 NCERT Solutions for class 9 maths all chapters with complete explanations in PDF. Other exercises like Exercise 14.1 or Exercise 14.2 or Exercise 14.3 are given to use online or download to use it offline. The mean of the following data is 50. In a school a student who scored 80% or above in his/ her previous class is eligible for “Merit scholarship” Marks obtained by two students Nishi and Vinayak of class IX in their previous class (VIII) in all subjects are given below. Name Hindi English Maths Science SSt. Skt. The blood group of 30 students of class IX are recorded as follows. A, B, B, B, O, B, B, A, AB, A, O, B, O, A, B ABAB, A, AB, B, A, O, AB, B, A, O, B, AB, A, AB. 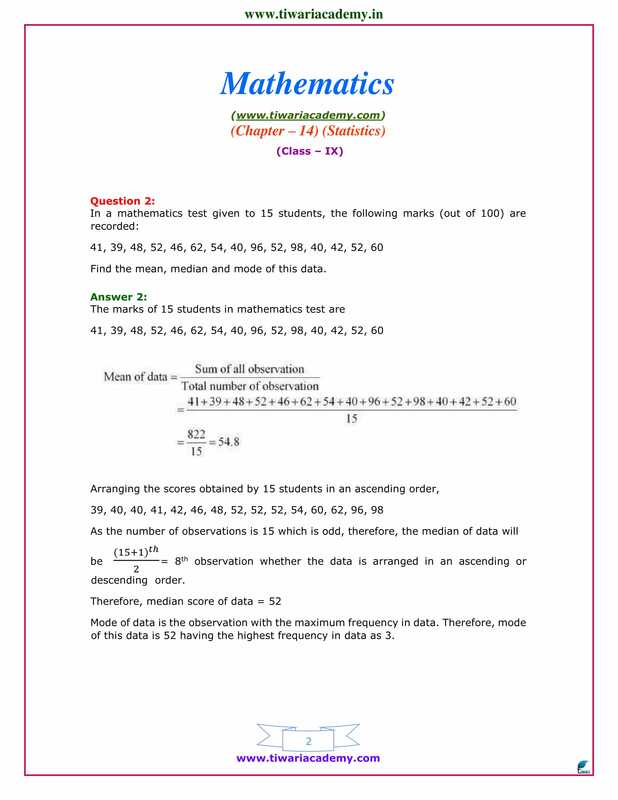 a) Make a frequency distribution table for the above data. b) Mr. ‘X’ meets an accident and needs blood. His blood group is AB. How many of these students can donate their blood to Mr. ‘X’? 15 students of Govt. school spend the following numbers of hours in a month for doing cleaning in their street 25, 15, 20, 20, 9, 20, 25, 15, 7, 13, 20, 12, 10, 15, 8.
i) Find mean, Median and mode from above data. In an assembly election the number of seats won by the different political parties is shown below. i) Draw a bar graph. ii) Which political party won by availing maximum number of seats. iii) What is the minimum age of a voter to cast his/ her vote in India in assembly election? The following table shows no of voluntary blood donor as per day in voluntary blood donation camp organized by Govt. of Delhi. Draw a bar graph showing above information. i) In which day donation was maximum and in which day it was minimum. ii) Why blood donation is necessary?